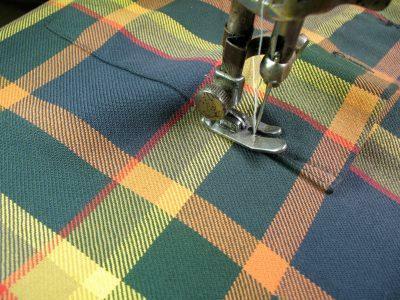 Knowing how to sew pleats is useful for making home decor, apparel, and other sewing projects. However, if you're new to sewing, this technique may seem intimidating. Luckily, all you need is a good set of instructions and some patience. Soon you'll be adding pleated ruffles to all your projects. What type of fabric are you using? Natural fibers like cotton or linen lend themselves well to crisp pleats, while synthetics and silky fabrics don't have the body necessary to hold the shape. Look for a fabric that is not too drapey. What type of pleats do you want to make? You can make pleats that go in either direction on the fabric, also known as accordion pleats, or you can make inverted or box pleats that meet from opposite directions. It all depends on the pattern you're using and the look you have in mind. How wide do you want your pleats? You can make large pleats for a slipcover or flowing skirt, or you can make tiny pleats for an apron ruffle. Before you pleat your fabric, you should hem it. It's much more difficult to make a neat hem after you've finished your pleats, so it's a good idea to get this out of the way ahead of time. Decide on your desired pleat width and direction. Use the ruler and pencil to mark the width on the piece of cardboard. Cut the cardboard piece slightly larger than your pleat, and draw a straight line for the pleat width. This will be a gauge to help you make the pleats. To make your first pleat, fold the fabric in the desired direction. Slip the cardboard gauge between the layers of fabric to make sure the width is consistent. Line the fabric up with the straight line you drew on the cardboard. Finger crease the fabric in this position, and then use pins to secure it. Remove the cardboard piece, and iron the pleat. Repeat this process until you have the desired number of pleats. Iron each pleat individually for the best results. When you're done, you'll have a row of pleats with pins securing them. Use your sewing machine to run a line of stitches along the top edge of the pleats. Keep the stitches near the raw edge so you won't see them when you use your pleated panel in you project. Take your time. Pleating fabric lends a beautiful and classic look to your work, but it isn't a fast process. If you work slowly, your pleats will be neater. If you'll be making a lot of pleats, consider using a special tool like Quick Pleater. While tools aren't necessary, they can make the process easier. Remember to allow for extra fabric as you plan your pleated project. Pleating takes up three times the amount of fabric as the final dimension. For example, if you're making a three-inch pleat, you'll need nine inches of fabric. Allow for three inches for the top layer, three inches for the second layer, and three inches for the final layer. Use lots of pins and iron often for the best pleats. You want very little fabric movement when you finally sew the stitches to secure your work. Make a throw pillow with a pleated ruffle. Add a pleated ruffle to the bottom of a retro-style apron. Make pleats to attach as trim for a ready-made bed skirt. Add pleated trim to a garment you already own. Pleating is a versatile sewing technique, and you'll find that you use it often in your work. By varying the depth and direction of your pleats, you can create dozens of unique ruffles to decorate any project. Experiment with pleating to find new looks you love.